6.87 points at 15 votes (rank 383). 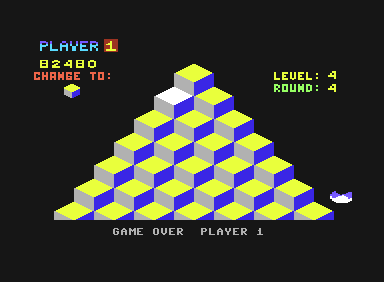 Level start: Q*bert demonstrates how the target colour is reached. In this arcade classic you steer Q*bert, a droll tot that looks like a ball with a trunk on two legs, over a pyramid-like built 3D game area. When getting contact with the flat surfaces Q*bert changes their colour. 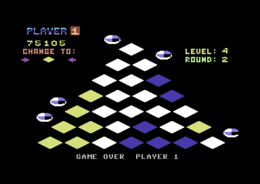 At the beginning of each level you get a demonstration of what the target colour is and how often Q*bert has to touch a field to reach this colour. In higher levels, the surfaces that are painted in the target colour are changed back when Q*bert enters them again. Furthermore, there are destructive green men named Slick and Sam, which have nothing else to do than sabotage Q*berts work by changing the colour of the fields. Q*bert can only avoid this by catching them. Almost all other enemies are more dangerous than the two green scallywags Slick and Sam. From the top you permanently get a hail of balls, which Q*bert - except for the green "Time Freeze" ball - must avoid touching in any case. From the purple coloured ball hatches the snake Coily, which must be eliminated by a jump on a Flying Disc. Finally also Ugg and Wrongway monster horizontally over the game area in a bizarre way. They also must not get too close to Q*bert. As soon as Q*bert has painted all flat surfaces, you go to the next round. If he has made four rounds, he gets into the next level, whereby it gets more complicated to reach the target colour with rising speed and more and more enemies. Graphics: Although it might astonish in retrospective that there is hardly any difference to see in the C64 version compared to ports for older, technically inferior platform, one has to make clear to himself that this is a game from the beginning of the 80s. Measured at the year of issue and the arcade machine original there is hardly anything to complain about in the graphical realisation, on the contrary, the funny sprites are well animated and also the choice of colours was successful which at that time was not a matter of course. Sound: Q*bert is not a really a treat for the ears on the C64, but this also goes for many other ports, that sound amazingly similar. But concerning the FX the arcade machine was unmatched. The snake Coily is tricked by Q*berts jump on a flying disk. 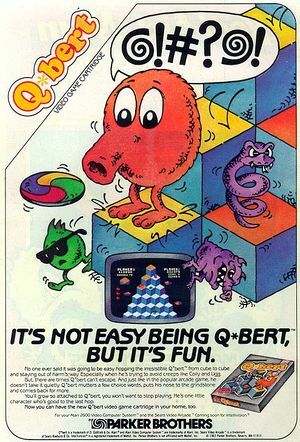 Q*bert scolds dumb players that cost him a life. The realisation of the controls in the C64 version and other ports on the other hand is comparatively strange, because it cannot really be aligned with the 3D perspective. Especially when jumping on the Flying Discs you first have to get used to the "diagonal" controls. Tip: For some it might be a help to simply turn the joystick 45° to the right. Q*bert This cute, trunk-equipped guy is controlled of the different pyramids in this game. Shame to him who thinks any phallic thoughts when looking at this innocent hero. Red ball So much for "all good things come from above"! Q*bert has to avoid these balls, because if he gets one onto his head, trunk or foot, he will lose a life while scolding with words that have to be censored. Purple ball These balls also hurt at contact. Even worse, instead of falling down from the last step of the pyramid, the snake Coily is hatched in these balls. Coily Coily hatches from the purple ball. It follows Q*bert mercilessly over the game area and is with this the only real intelligent and most dangerous enemy. You will get rid of this squeaking spring of a snake by luring it near a Flying Disc and jumping on it. 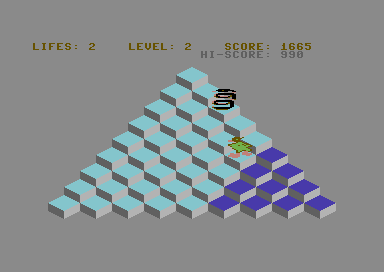 If Coily is near enough to Q*bert, it will jump after you foolishly and crash which gets to full 500 points. Ugg and Wrongway Despite the two names, these guys can even appear more often at the same time. They move strangely horizontally from both sides over the pyramid. They ignore the laws of gravity, go up the walls in the truest sense and finally fly away. At the same time they make very weird noises. You cannot destroy them directly but when you eliminate Coily, also all incarnations of Ugg and Wrongway disappear. Sam and Slick Sam and Slick are unnerving but mostly harmless. Q*bert can eliminate them by catching up with them thanks to slightly higher speed or by cutting off their way. He should do one of these, because they destroy all the work done while whistling derisively by recolouring the fields, which especially in more complex levels can be utterly annoying. Green ball One of the few helpful objects is the green ball, also named "Freeze Ball". If Q*bert catches this ball, the time stops and Q*bert is invulnerable for a short time of a psychedelic tune. Flying Disc By the Flying Disc Q-Bert gets safely to the top of the game area. If he has lured Coily near him, it will crash which gets you 10 times more points compared to the 50 points bonus at the end of each level for not used discs. Furthermore, all other enemies disappear the moment when Coily lets out its death scream. If you are standing (!) on the uppermost field, Q*bert cannot get any balls on his head. So you can e.g. wait there until a ball has fallen before you start moving. Coily is not the brightest creature but also not totally dumb. 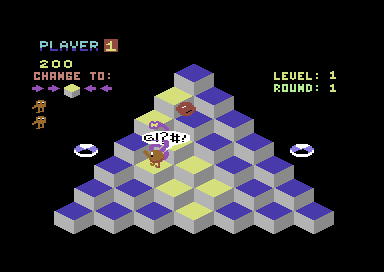 Q*bert does not have to get it super close but when he jumps on a Flying Disc and it is still very far away, it will not get lured into the abyss. Trainer versions are easy to find, see Links. TheRyk: "There is no reason to be particularly enthusiastic about this conversion, but all in all, the Parker Brothers Version for C64 is solid work, especially if you keep in mind that game development was still kind of undeveloped in 1983. Never became as addicted to Q*bert as my mother did back in the 80s on Atari console, but I still like to play it time and again, 6 points." Robotron2084: "Solid conversion with nicely squawking SID and later also high speed, about which I can hardly complain, except for the jittery animation of the sprites. 7 out of 10 points." There is a rather unfinished seeming alternative version by Phill Brown and Anthony Garcia. The pyramid there is very small dimensioned, the controls are like in the arcade original and the level order seems to be completely arbitrary (in round 3 it gets easier than in round 2). The collision query is a catastrophe and from round 3 it goes totally nuts and gets unplayable, so that one cannot say if there are more enemies than the ball at all (only Sam is announced on the title menu). To make matters worse there is no denying by any stretch of the imagination that there is a resemblance of the player sprite to a male sexual organ in this unsuccessful version. Rather well-known and recommendable to friends of the game principle is Slinky by Cosmi from 1984, which is clearly recognizable as a Q*bert clone despite many modifications. This millennium has also seen at least one Q*bert clone, a "homebrew" game named B-Bert, which ssdsa has created as part of a 20 line basic competition in the Forum 64 - with a considerable result measured at the type and range, although no noteworthy threatening AI is offered. Version by Phil Brown and Anthony Garcia. B-Bert, a Q*bert clone from 2008. 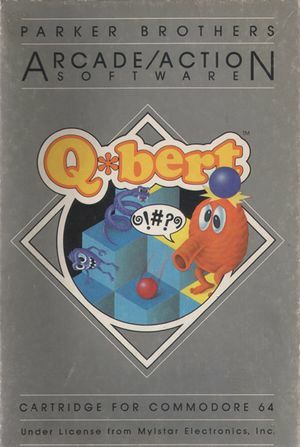 The name "Q-Bert" is supposed to be a combination of "Cube" and Herbert. The arcade machine was equipped with speech output, which at that time was relatively rare. However, the characters all only utter some fantasy-gibberish. Allegedly, it is said to have led to hoots with infantile, homophobe arcade fans with misguided fantasy in Germany, that some of the gibberish of Ugg and Wrongway sounds in German similar to the exclamation "Ihr Schwulen!" meaning "You gays!". Not exactly a noteworthy, successfully or respectively long gameplay, but it gives you an impression of the game. Q*bert in the Killer List Of Videogames.